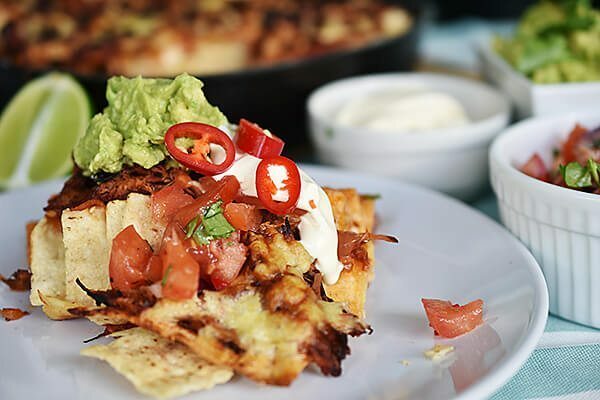 These Pulled Beef Nachos will only take you a few minutes to throw together and are the perfect recipe to whip up when friends drop by. You don't have to be a Mexican food lover to enjoy these and can serve with or without sour cream and jalapenos. Most of the ingredients can easily be found in most pantries or refrigerator, making it even easier to throw together. For the most part, this recipe is best served up with fresh guacamole, sour cream and a little jalapeno as the "cherry on top". Set up your barbecue for indirect cooking. Please refer to your handbook for further instructions. Preheat your barbecue for roasting. Lightly grease a large Q ware frying pan. Place corn chips into pan. Sprinkle the grated mozzarella cheese on to the corn chips. Scatter the Mexican pulled beef on top, finish by sprinkling the grated tasty cheese all over. Once the barbecue has preheated, make adjustments to the burner control(s) if required for the roasting setting. Place the nachos on and cook for 20 minutes, or until the cheese is golden. While the nachos are cooking, make the guacamole and tomato salsa. For the guacamole, mash the avocado, add the lime juice and coriander, mix together and season with salt and pepper to taste. To make the tomato salsa, combine the tomatoes, onion, chilli and olive oil together, season with salt and pepper. Once the nachos have cooked, remove from the barbecue. Serve with the guacamole, tomato salsa, sour cream and jalapenos.